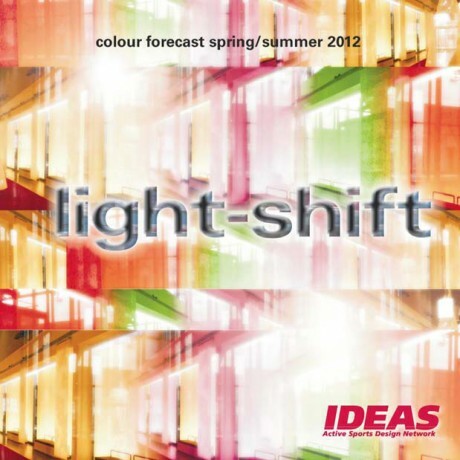 IDEAS has chosen the emblematic keyword “Light-Shift” for its colour forecast summer 2012. Light is life and the word itself sparkles with a lot of positive connotations both in physical and figurative senses. Light is never tangible and only visible by refraction. The alternation of day and night, between brightness and darkness beats the rhythm of our lives as master clock. Inspired by the magnetic field between natural and artificial light the IDEAS group tells six stories about light and darkness. Here a short description of each colour theme. 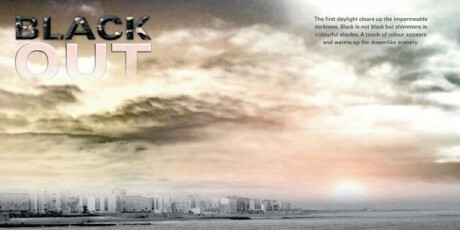 “BLACK OUT” is the story of the first daylight which clears up the impermeable darkness. Black is no longer only black but shimmers in colourful shades. A palette of refined and soft non-colours. Subtle shades of black as background frame. Vintage brass for an essential warm shine. Colours melt into each other and flow away. No sharp contrasts. „DAZZLING LIGHT“ stands for a theme about days bursting with vibrating light. Weather as bright as can be. A perfect summer mood – nearly surrealistic. Bright and intense colours. Slightly over-exposed due to the power of the sun. Transforming sunbeams in eye-popping brilliancy. Accents are set by high shine aluminium silver. 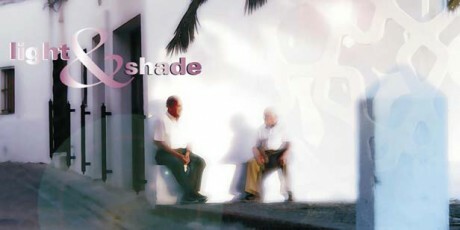 „LIGHT & SHADE“ – magical twilight reveals and hides at the same time. An eternal play of silhouettes and shades. Timeless and authentic. A beautifully balanced colour palette – each shade calmed by a touch of grey. Blue mist, creamy yellow and light green are framed by black, dark olive and reddish violet. Playing with the idea of shadowy light, this range creates a moody yet modern look and never gets sinister. 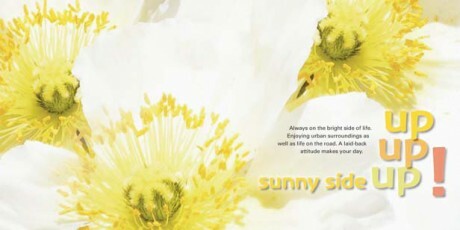 „SUNNY SIDE UP!“ is inspired by the power of the sun and its positive effects for our body and soul. Enjoying urban surroundings as well as life on the road. A laid-back attitude makes your day. Vivid shades of yellow and orange pair with dark blue, polished concrete and earthy brown. Loaded with luminous energy. Optimistic and playful. „LIGHT PAINTING“ is definitely the theme of our era. Artificial lighting effects stamp our perception of colours. Reflected and dispersed. Modulating spaces with an air of mystery. Shiny silver highlights a range of deep blues. White, cheeky pink and fluorescent yellow are crucial for edgy colour combinations. 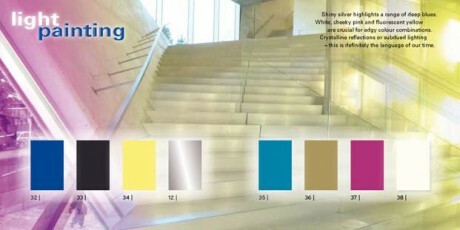 Crystalline reflections or subdued lighting sparkle with technical coolness. 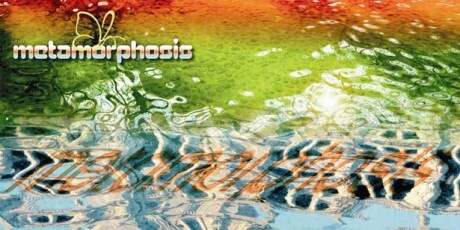 The last colour story „METAMORPHOSIS“ stands for the never-ending cycle of life. Light reflects perfectly the constant change and transformation of this cycle – a visual perception between fiction and reality. The opulent colour palette is grounded in its natural origins. A predominance of vibrant shades of warm red. Turquoise, deep sea blue, green and sunny yellow complete the range. Basic shades paired with amazing accents. A “green” story: Between robbing the planet and developing more sustainable concepts for the future we see a lot of natural colours. Shades of green pair with yellow and orange in harmony. A very intense and joyful story about shades of blue and pink. Light grey, dark navy and acid yellow set strong accents. Variations of red, grey and black in a dramatic and expressive story. Framed by pale lemon and pacific blue. Imagine a calm winter day without the brilliancy of any sunbeams. Colours are smooth and a bit greyish. Colourful accents by violet (either light or very intense) and rust. 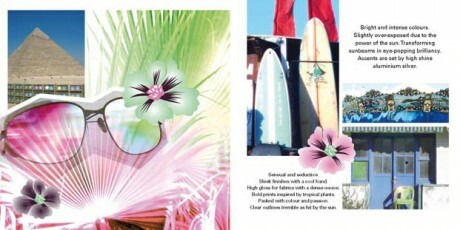 The complete IDEAS colour forecast for summer 2012 can be purchased exclusively by direct order via e-mail: news@ideas-designers.com.